A competent but colorless right-hander, Joe Lake had the misfortune of pitching for some of the Deadball Era’s worst American League teams. In six big-league seasons, he was never once a member of a winning team, and three of Lake’s clubs finished more than 50 games behind the pennant winner. Through it all, Joe labored without complaint, turning in a stream of reliable performances that garnered him the respect of opponents and the sporting press alike. After his playing days were over, Lake returned to the Brooklyn docks whence he had come, living as quietly in the workaday world as he had in the majors until his death at age 69. Joseph Henry Lake1 was born in Brooklyn on January 6, 1881. He was the third of eight children2 born to common laborer Joseph Henry Lake Sr. (1849-1926) and his wife, Katherine (née Burke, 1852-1927), both working-class Irish Catholic Brooklyn natives. Young Joe attended school through the eighth grade and then entered the local work force, eventually finding a job on the Brooklyn docks. No doubt fostered by the rigors of his employment, Lake developed into a strapping (6-feet, 185 pounds) young man. Pitching for a Jersey City club that would finish the season barely above the .500 mark, Lake quickly ascended to the forefront of Eastern League hurlers. And soon owner Davis was entertaining offers for Lake from major-league clubs, with the Cincinnati Reds, Philadelphia Phillies, and both New York teams being the most ardent suitors. In late August Lake’s contract was sold to the New York Highlanders, with delivery set for the end of the Eastern League season.12 The transfer prompted dismay in Cincinnati and particularly in Philadelphia, where manager Billy Murray, a minority shareholder in the New Jersey Exhibition Company, maintained that the Phillies had a prior claim on Lake’s services. An appeal to undo the sale made to Highlanders club boss Frank Farrell, however, availed Murray nothing.13 Meanwhile back in Jersey City, Lake was amassing sparkling numbers. By season’s end he was the Eastern League leader in wins (25) and strikeouts (187).14 He also played 13 games in the Skeeters outfield, and batted .273 in 154 at-bats, overall. The mid-September close of the Jersey City campaign afforded the new Highlanders pitching acquisition a brief late-1907 season stay in New York. It also provided the occasion for invocation of a record-keeping technicality whereby Joe Lake pitched three innings of uncredited regular season American League baseball some six months before the date of his official major-league debut. To explain: On October 5, 1907, the Highlanders were scheduled to finish their season with a home doubleheader against the Boston Red Sox. The first game was tied 3-3 at the end of 10 innings when inclement weather brought the contest to a halt. Some 30 minutes later, the weather had cleared, but rather than resume play of the suspended game, umpire Silk O’Loughlin declared it a draw and ordered the second game to commence. On the mound for New York in Game 2 and making his ostensible major-league debut was Joe Lake. He went three innings, holding Boston scoreless. In the estimation of the New York Times, “Lake’s work was satisfactory. He was touched up for four hits during his reign … but in pinches he was master of the situation, fanning Harry Lord and Heinie Wagner in succession and leaving Moose Grimshaw, who had doubled, on the base.”15 With the game scoreless in the top of the fourth inning, gloom and the arrival of more bad weather made further play impossible. The second game was therefore called off, erasing it and Lake’s maiden major-league appearance from the record book. While he awaited the chance to make an officially recognized major-league appearance, Lake returned to Brooklyn to live with his parents and work on the docks. But before the Highlanders resumed play the next spring, Joe altered his domestic situation. On February 28, 1908, he married 25-year-old Josephine Eguiguren, also of Brooklyn. The following year, the birth of their only child, a daughter named Anita, would complete the family. For the better part of the next three seasons, Lake was sentenced to pitch for Browns teams that would come no closer than 53 games behind the American League pennant-winner. As in the previous season, Joe got off to a good start personally. In late July, a 4-3 victory over New York raised his record to 9-6, leading one newspaper to describe Lake as “one of the American League’s best pitchers.”21 Thereafter, overuse and a hapless supporting cast put Lake’s pitching log into a tailspin.22 Still, his 11-17 (.393) record was considerably better than the dreary 47-107 (.305) mark posted by St. Louis overall, and Joe paced the Browns staff in wins, winning percentage, innings-pitched (261⅓), ERA (2.20), and strikeouts (141). 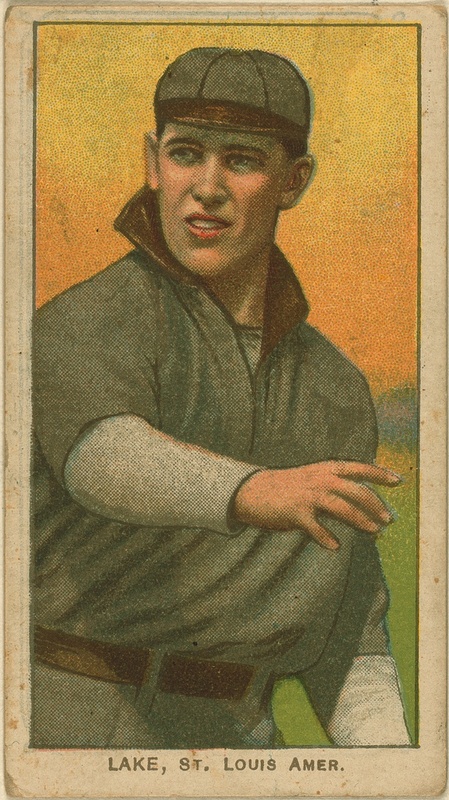 With the Browns headed for a 53-101 final record in 1912 and with his personal log standing at 1-7, Lake was finally reprieved from St. Louis, being sold to the Detroit Tigers in late June.25 Pitching for a merely mediocre club rather than a terrible one, Lake turned in serviceable work for the sixth-place (69-84, .451) Tigers. His 9-11 (.450) second-half mark closely approximated the general Detroit pitching percentage norm, while his 3.10 ERA was markedly better than the 3.77 staff standard. Given that, the pitching-thin Tigers included the soon-to-be 32-year-old Lake in their 1913 plans. Born in Brooklyn, Joe Lake lived his entire life there. When he completed his registration form for the World War I draft in September 1918, Lake listed his occupation as “marine electrician foreman” for a borough dry-dock company. He may also have retained his old side job as a golf pro at the Marine Park Golf Club in Brooklyn. Joe continued to work as an electrician on the docks until his retirement in 1947, living as quietly out of the limelight as he had when pitching for major-league ballclubs in New York, St. Louis, and Detroit. Late in life, Lake developed stomach cancer. He was admitted to Methodist Hospital in Brooklyn for surgery in June 1950, and died there from peritonitis and surgical complications on June 30.35 Joseph Henry Lake was 69, and “to his final day he was a very enthusiastic baseball fan and follower of all the records.”36 After a funeral service in Brooklyn, his remains were interred in St. John Cemetery in Middle Village, Queens. Survivors included his wife, Josephine, daughter, Anita Lake Pederson, and brother, George Lake. Sources for the biographical info recited herein include the Joe Lake file maintained at the Giamatti Research Center, National Baseball Hall of Fame and Museum, Cooperstown, New York; US and New York State Census data and Lake family posts accessed via Ancestry.com; and various of the newspaper articles cited below. Unless otherwise noted, stats have been taken from Baseball-Reference. 1 Our subject was named for his father and at least two censuses (1905 New York State; 1910 US) lists him as Joseph H. Lake Jr. But no evidence that Joe himself ever used Jr. was discovered by the writer. 2 The other Lake children were John (born 1874), Ella (1876), William (1884), Agnes (1887), Margaret (1890), George (1892), and Caroline (1896). 3 One mention of Lake states that he started his career as an outfielder and did not begin pitching until after he joined the Jersey City Skeeters of the Eastern League in 1907. See C.F. Stack, “Players Who Were Slow to Find Themselves,” Baseball Magazine, March 1914, Vol. XII, No. 5, 43. This is incorrect. Although the good-hitting Lake was sometimes used in the outfield during his minor-league playing days, he was clearly “pitcher Lake of Peekskill” in his maiden pro season. See Sporting Life, July 1, 1905. 4 As per the NAPBBL bulletin of April 12, 1905, published in Sporting Life, April 22, 1905. Lake’s error-cluttered obituary in The Sporting News, July 12, 1950, stated that his career began in the 1904 Hudson River League. 5 See Sporting Life, July 1, 1905. 6 As per Sporting Life, October 5, 1905. More than 60 years later, Lake’s daughter, Anita, would inform baseball genealogist Joe Simenic that her father won “25 out of 32 games pitched” in 1905. See letter of Mrs. Herbert L. Pederson to Joseph E. Simenic, dated November 27, 1968, contained in the Joe Lake file at the Giamatti Research Center. 7 See, e.g., Sporting Life, June 2, 1906: Lake recorded 12 strikeouts in a May 10 victory over Poughkeepsie; Sporting Life, July 28, 1906: Lake threw a one-hit shutout at Kingston on July 11; Sporting Life, August 18, 1906: Lake pitched a three-hit shutout in Kingston on August 7; Sporting Life, September 8, 1906: Lake hurled a three-hit shutout over Tri-County on August 23. 8 As per the 1907 Reach Guide, 356. Baseball-Reference has no 1906 stats for Lake. 9 As reported in the (Jersey City) Jersey Journal, January 23, 1907, and Sporting Life, March 30, 1907. 10 Jersey Journal, April 3, 1907. 12 Sporting Life, July 27, 1907, reported that the AL New York club had offered $5,000 for Lake. So did the Jersey Journal, August 30, 1907. Later, the baseball weekly maintained that New York had sent veteran major-league pitchers Del Mason and Earl Moore and an undisclosed amount of cash to Jersey City in exchange for Lake. See Sporting Life, December 14, 1907, and January 8, 1908. 13 As per Sporting Life, September 7, 1907. 14 As per The Encyclopedia of Minor League Baseball, Lloyd Johnson and Miles Wolff, eds. (Durham, North Carolina: Baseball America, Inc., 2d ed., 1997), 153. 15 New York Times, October 7, 1907. 16 As reported in Sporting Life, April 27, 1908. 17 Years later, Lake maintained that he had learned to throw the spitball from Jack Chesbro. See the Salt Lake Telegram, April 25, 1913. But contemporary reportage plainly establishes that Lake already had the spitball in his pitching repertoire before he became a Highlanders teammate of Chesbro. See endnote 11, above. 18 New York Times, April 22, 1908. 19 Sporting Life, January 9, 1909. 20 On December 16, 1909, New York sent Lake, outfielder Ray Demmitt, and cash to St. Louis in exchange for catcher Lou Criger. 21 See the Macon (Georgia) Telegraph, July 22, 1910. 23 See, e.g., the Macon Telegraph, April 30, 1911. 24 See J.G. Davis, “Two Decades to Establish Game of Golf in This Country,” Seattle Times, July 6, 1911. The author’s choice for major-league baseball’s best golfer was equally improbable: Bronx native and apprentice plumber Heinie Zimmerman. 25 St. Louis would have released Lake and fellow veteran pitcher Barney Pelty earlier in the season, but Washington Senators manager Clark Griffith would not let the pair pass through waivers. Only the ensuing sale of Pelty to Washington freed up the sale of Lake to Detroit. See Sporting Life, June 15 and 29, 1912. 26 As reported in the Jersey Journal, New York Times, and elsewhere, August 25, 1913. Lake and Rondeau were dispatched to Minneapolis in partial payment for pitching prospect Ralph Comstock. 27 Apportioning the time he spent in 1912 between St. Louis (14-34) and Detroit (44-58), the clubs that Lake pitched for posted a cumulative 326-549 (.373) record. Subtract Lake’s numbers, and the cumulative club record sinks to 264-459 (.362). 28 For four seasons running (1908-1911), Lake had been among the top five in errors committed by AL pitchers. 29 See Sporting Life, January 7, 24, and 31, 1914. 30 See the Jonesboro (Arkansas) Evening Sun, July 24, 1914. 32 As reported in the Fort Worth Star-Telegram, Muskegon (Michigan) Chronicle, and (Portland) Oregonian, February 16, 1915. 33 As reported in the Baltimore Sun, June 13, 1915. 34 As reported in the Springfield (Massachusetts) Republican, May 13, 1918, Tulsa World, May 16, 1918, and San Jose Mercury News, May 27, 1918. 35 As per the death-certificate summary contained in the Joe Lake file at the Giamatti Research Center, and Lake’s obituary published in The Sporting News, July 12, 1950. 36 Letter of Mrs. Herbert L. Pederson to Joe Simenic, above.